Colonial Couple Plaques - KW115 Discounts Apply ! 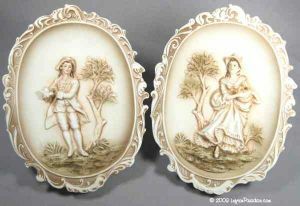 A lovely pair of oval-shaped plaques, depicting a young man and woman in 18th-Century garb. Each is exquisite in detail. Marked KW115 with the Lefton crown logo and remnant of stickers on each plaque. The measure 8 inches tall.